To respond to a classified or other post, log in and click 'email contact form' as shown below. 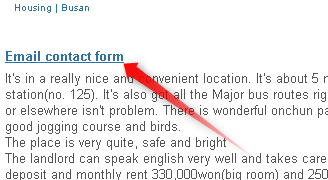 Please note: If you click the contact option in the top menu, you will send an email to the Koreabridge Management Team, not the person who posted the ad. You can also send a user a Private Message by clicking on the username and clicking 'Send PM' on their profile page.